I don't just love it for the guilt free sweeties though, I love the pumpkin carving, the dressing up and most of all, its an excuse to decorate your home. Here are a few bits of our Halloween accents, some of them I made a few years ago, but most of which I bought today whilst I was supposed to be shopping for paint, I didn't even get that paint! On top of our stove fire, I have these teeny-weeny pumpkin LED lights, they are too cute. 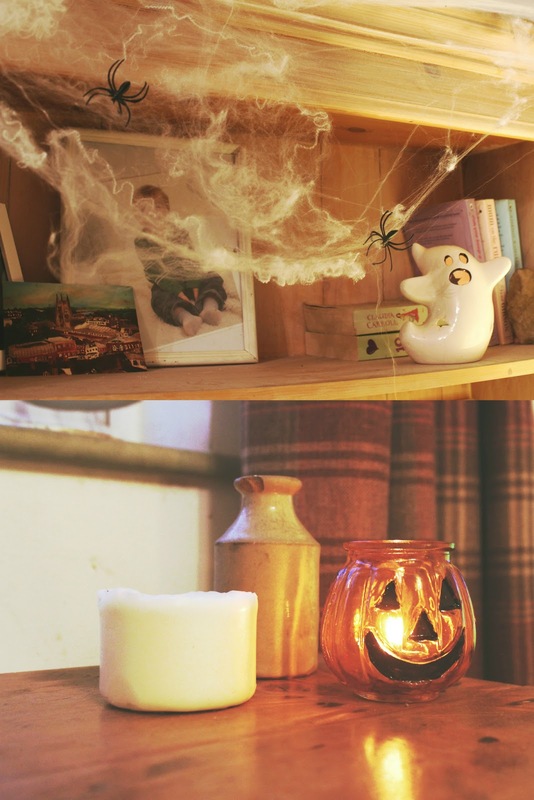 There is also a glass pumpkin tea light holder and a few cobwebs and spiders among the dried wheat. 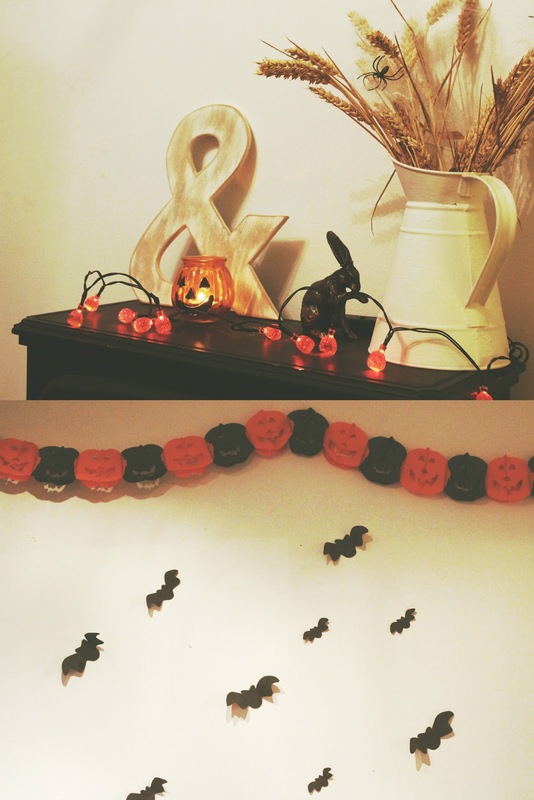 In the kitchen we have a pumpkin garland with some bats on the wall. Easy peasy bats, cut out from some card and folded to give some definition. More cobwebs and spiders hanging from the bookshelf with a ghost tealight holder. There is also another glass pumpkin on the desk. On the kitchen table there is a collection of witches potions which I made with some some empty glass bottles. I poured black paint into them and shook it about, and then emptied the excess. I got some plain paper, tore into ragged label size pieces and wiped a wet teabag over them to add some age. 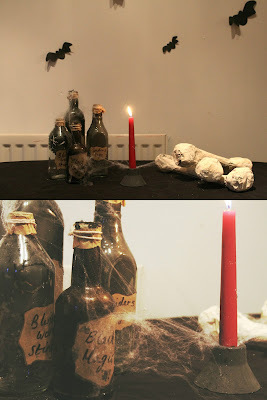 Once dry I just wrote some potion ingredients on each of then and stuck them onto the bottles. Simples. Oh, and more cobwebs..
On the desk along with the glass pumpkin we have our rat family, you can't see on the picture but two of them are tailless, poor rats... And next to the potions on the kitchen table are bones, huge bones. 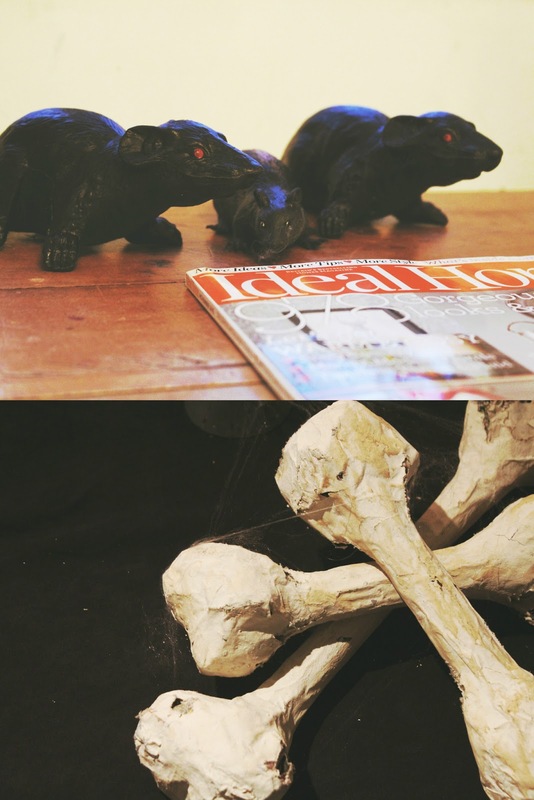 I made these from rolled up magazines, newspaper and paper mache. They were painted white and also wiped with tea to add age. 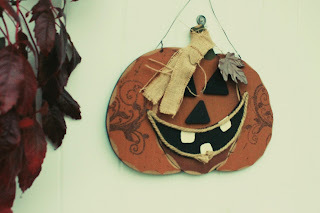 Oh, I forgot to mention the top picture, that pumpkin is hung on our front door. I picked it up from B&M last week, it was reduced, a lot, and I'm not even sure why, so bargain! So that's how our home is looking at the moment, if I had my own way though I'd really go overboard and it would be terrifying. Obviously having two children under 10, I can't... Well, I could. No, I can't..ssh!